Touchpoints Birth to Three by T. Berry Brazelton, M.D. The past two days we quoted T. Berry Brazelton, M.D. in two articles that show his empathy for mothers and deep respect for in-home childcare providers. See his list of best characteristics a great caregiver should have by clicking here. His book, Touchpoints, is easy to understand and the author’s approach to childcare is very gentle. 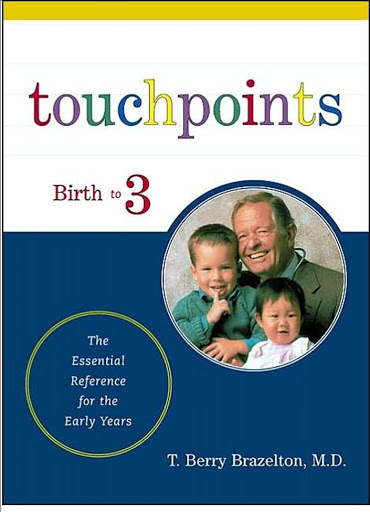 Based on over three decades of continuous practice and internationally recognized research, his book, Touchpoints is the only childcare reference by a pediatrician who has both medical and psychoanalytic training, and who offers parents a complete understanding of child development from a physical, cognitive, emotional, and behavioral point of view. No other childcare guide offers supportive, empathetic insights into the parents’ own emotions, and no other guide includes both chronological chapters and alphabetical topics on all issues faced by families from conception through age six. “Touchpoints” are the universal spurts of development and the trying periods of regression that accompany them throughout childhood. Dr. Brazelton uses them as windows to help caregivers understand children’s behavior. Part one of the book discusses the “Touchpoints of Development.” This section covers the chronological account of the basic stages of early childhood. Every chapter covers: feeding; crying; temperament; social learning; stranger awareness; discipline; sleeping; learning; emotions; independence; self image; sexuality; communication; motor skills; attachment; play; self-esteem; and toilet-training. Part two covers the “Challenges to Development.” The challenges of development section is a complete alphabetical reference. Each entry shows how to understand, defuse, and prevent potential problems such as: allergies; bed wetting; crying; depression; discipline; divorce; fears; feeding problems; headaches; hearing problems; hospitalization; hyperactivity; hypersensitivity; imaginary friends; loss and grief; lying and stealing; manipulation; nightmares; school readiness; self-esteem; separation; sibling rivalry; sleep problems; speech problems; stomachaches; television; and toilet training. Part three discusses “Allies in Development.” This section explains the important role of each person in a child’s life: fathers; mothers; friends; caregivers; grandparents; and doctors. Touchpoints is an essential reference is a great resource for parents and all at-home caregivers. If you have a great book you would like to share with other nannies or au pairs please email Stephanie@bestnannynewsletter.com with your book review. Stop by next Saturday for another Weekly Trip to the Library for nannies and au pairs.